“Neither the president nor members of Congress are helped by confrontation for the sake of confrontation,’’ said Senator Patrick Leahy, who was elected nearly four decades ago. WASHINGTON — He lives on a dirt road, enjoys swapping long stories, and fires pistols in his backyard. He even loves the Grateful Dead. 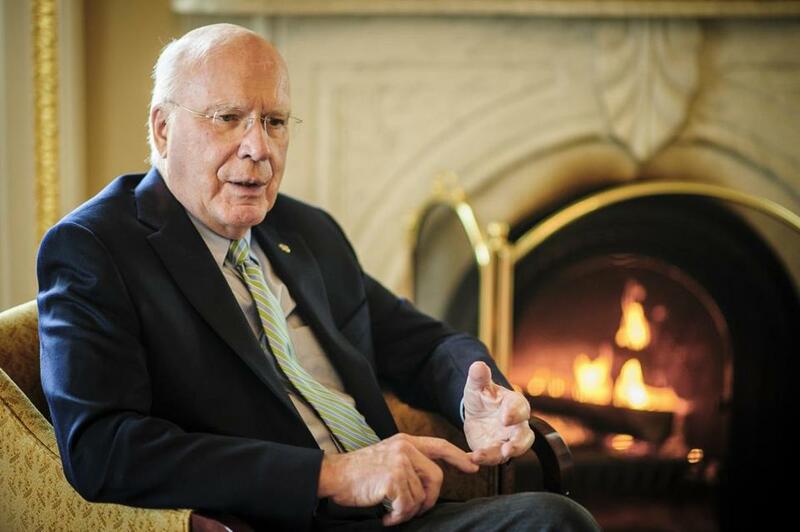 Senator Patrick Leahy, in other words, is a fairly typical Vermonter — right down to his low-key style. Elected to the Senate in 1974, he is the chamber’s longest-serving member and chairman of the Judiciary Committee, giving him a traditional perspective that will be tested in the weeks ahead as the polarized chamber takes up the issue of gun control. Leahy’s committee is in the midst of producing a package of bills that would seek to reinstate the nation’s assault weapons ban and limit ammunition capacity, strengthen the system of background checks, and penalize “straw buyers’’ who purchase firearms for people who would otherwise be barred from buying them. Even after the Newtown, Conn., school massacre last year, most observers in Washington say it is unlikely Congress will pass a ban on assault weapons or limit ammunition capacity. Leahy instead will be attempting to seek some level of consensus on the package’s less controversial elements. Yet even those have drawn criticism from Republicans, and prospects for a deal in the ideologically divided Congress remain uncertain. The gruff-voiced Leahy — who, based on his seniority, recently secured the position of Senate president pro tem — expressed dismay over the dwindling level of bipartisan cooperation in the Capitol over a variety of issues, including gun control, immigration, and court nominations. The Judiciary Committee will reconvene Thursday to debate the ban on assault weapons and high-capacity magazines. On Tuesday, Leahy and his Democratic majority, on strict party lines, advanced a proposal for universal background checks. The Democrats received considerable GOP support on a second bill to provide $40 million annually for school safety measures. Last week the committee approved the bill to crack down on straw buyers. Leahy cowrote that gun trafficking proposal with Senator Susan Collins of Maine, who lauded the Vermont senator’s negotiating style in his efforts to cut a deal. Despite Leahy’s opportunity in December to claim the top spot on the influential Senate Appropriations Committee — formerly chaired by the late Hawaiian Senator Daniel Inouye — the onetime prosecutor chose to stay put at the helm of the Judiciary Committee. After the mass shooting at Sandy Hook Elementary School in December left 20 children and six adults dead, Leahy said he knew the gun-control debate was set to explode. Immigration wasn’t far behind, making his decision to remain on the Judiciary Committee — and perhaps put his stamp on resulting legislation — an easy one. Last week, President Obama signed a reauthorization of the Violence Against Women Act, cowritten by Leahy to expand its protections to Native American women and gay couples. The senator was born in Montpelier in 1940, and his parents owned a printing press about a mile down the Winooski River from the Vermont State House. After graduating from St. Michael’s College and Georgetown University Law Center, he served as state’s attorney in Chittenden County before running for Senate. Leahy and his predecessor George Aiken, a moderate Republican, have held one of Vermont’s seats in the upper chamber since 1941. Sworn in long before the Republican Revolution of the mid-1990s, he came to office when cross-party relationships thrived and bipartisanship was an expectation — not a talking point, said Garrison Nelson, political science professor at the University of Vermont. Leahy, who was born blind in one eye, is an avid photographer. Between narrating the stories behind pictures as they flashed across his computer screen, he recalled a lesson learned from conservative and liberal Senate icons Barry Goldwater and Edward M. Kennedy: “The person who’s opposing you today may be your cosponsor tomorrow.” Leahy added, “When we did things together [outside the Senate] — especially with our spouses, we worked pretty well. Following the Judiciary Committee markup Tuesday, Chuck Grassley echoed Leahy’s nostalgic take on the days when lawmakers spent weekends in Washington. Grassley, a 32-year Republican veteran from Iowa, joined Leahy on a trip to Russia in 2011 to forge more personal ties before taking the GOP’s top spot on the Judiciary Committee. While riding the little Senate subway from his office building to the Capitol, Leahy smiled as he recalled hosting the Grateful Dead for lunch on Capitol Hill in the early-1990s. Conservative firebrand Strom Thurmond showed up unexpectedly, introducing himself as “the oldest member of the Senate” to frontman Jerry Garcia, Leahy said, imitating the South Carolina senator’s Southern drawl. His penchant for storytelling shows up during floor speeches and committee hearings, underscoring the difference between the old norm of sharing war stories after legislative battles and the new alternative of taking political shots on cable news. The senator’s tree farm in Middlesex, Vt., includes a pistol range. Observers say Leahy — a champion marksman in college — has always been a straight shooter politically, even if that doesn’t get him on TV every night. David Uberti can be reached at david.uberti@globe.com.